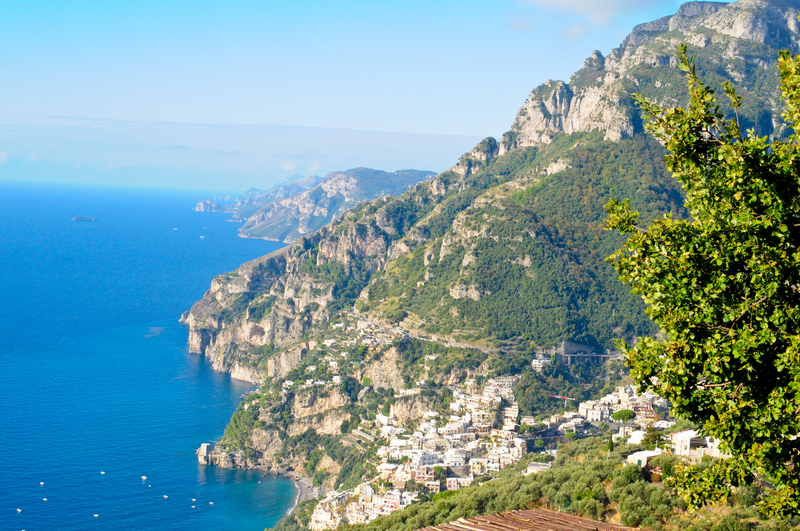 Along the Amalfi coast, high atop the bustling little town of Positano, there lies a magical place known as La Tagliata. Mama, Papa, and their three grown children- Peppe, Antoinetta, and Vincenzo welcome you like long-lost family. Don’t ask for a menu. There are none. Red or white wine is the only decision you’ll need to make. You will eat what the family serves with a ferocious appetite you never knew existed. You won’t be sorry and you definitely won’t leave hungry. If you’re like me, maybe you won’t leave at all. 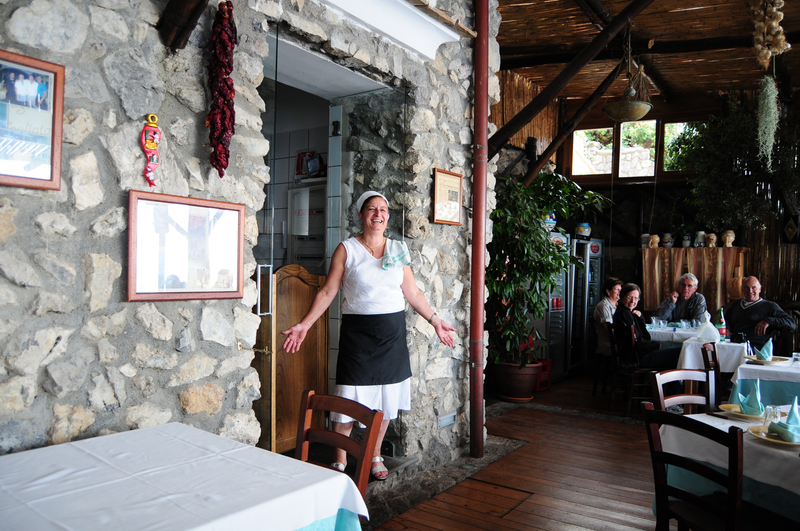 La Tagliata is the first place during my ten days of solo travel, where there is no language barrier. The family doesn’t speak much English, in fact Mama speaks none at all, but it doesn’t matter. All you need to know is understood with a touch, an expression, and a smiling gesture. 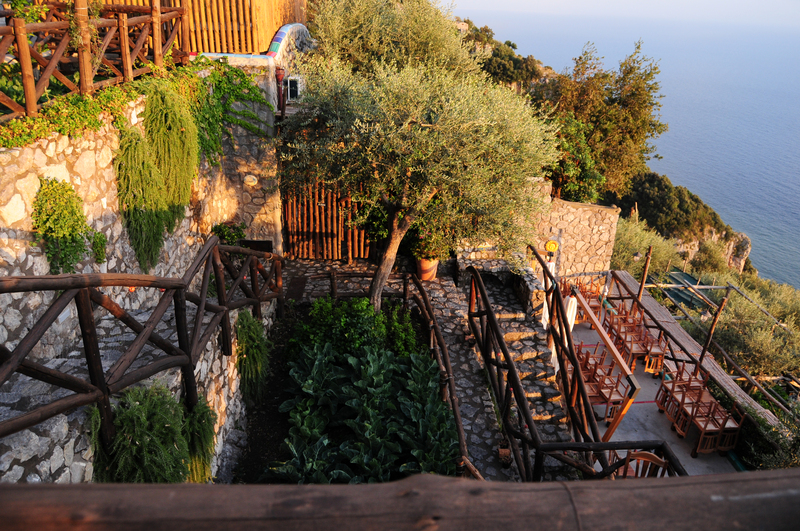 The stone and wood building is nestled on a Cliff overlooking the pastel buildings cascading below to the sea. There is a postcard-worthy view from every direction. Garlic and pepper ropes hang from the rustic wooden ceilings. The faint smell of a wood-burning oven lingers in the background, overshadowed slightly by the heavenly scent of a family’s Italian cooking. Plates of organically grown veggie dishes- broccoli, peas, potatoes, spinach, along with fresh mozzarella and prosciutto are brought to the table- and this is only the first course. They are followed by a platter of Mama’s assorted fresh pasta. Mozzarella stuffed gnocchi, cannelloni, ravioli are among my favorites. The lunch crowd cheers each time Mama pops her head out of the kitchen. She takes a bow before disappearing. The ambience of this heavenly place are almost indescribable. 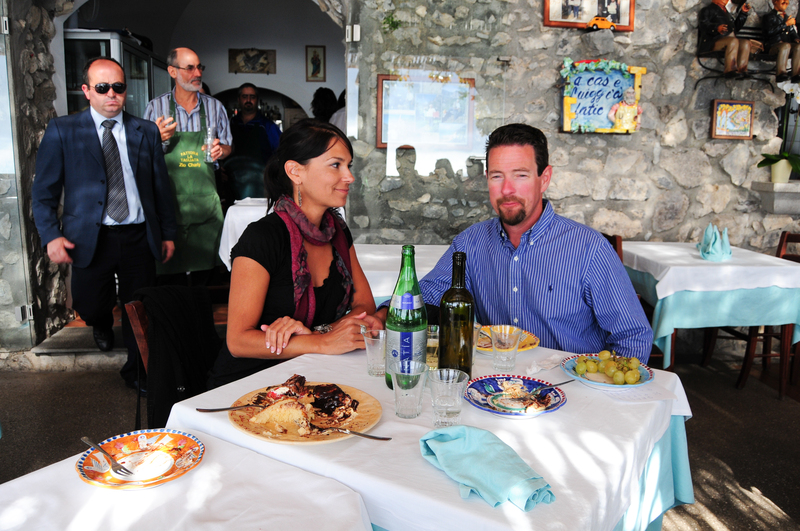 The only patrons not smiling, are those filling their mouths with authentic Italian cooking. Dessert plates are brought out, brimming with tiramisu, chocolate dipped pate a choux, and my favorite- Baba Rhum cake that is to die for. 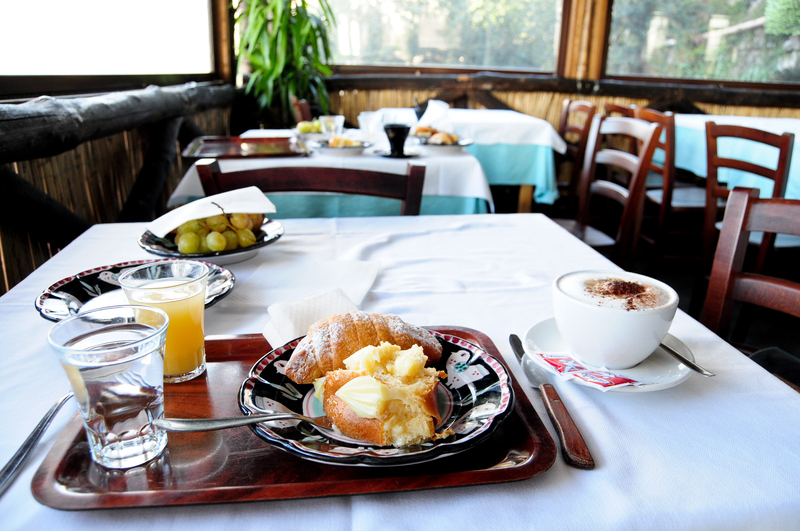 Shots of traditional Sorrento Limoncello, a deliciously sweet lemon liqueur, is served with dessert. As fate would have it, I ended up in this magical place after meeting a couple on vacation from California. They asked if I wanted to accompany them on a private tour of the Amalfi coast. How could I say no? Our comical driver, English-speaking driver Raffaelo kept us entertained throughout the drive. 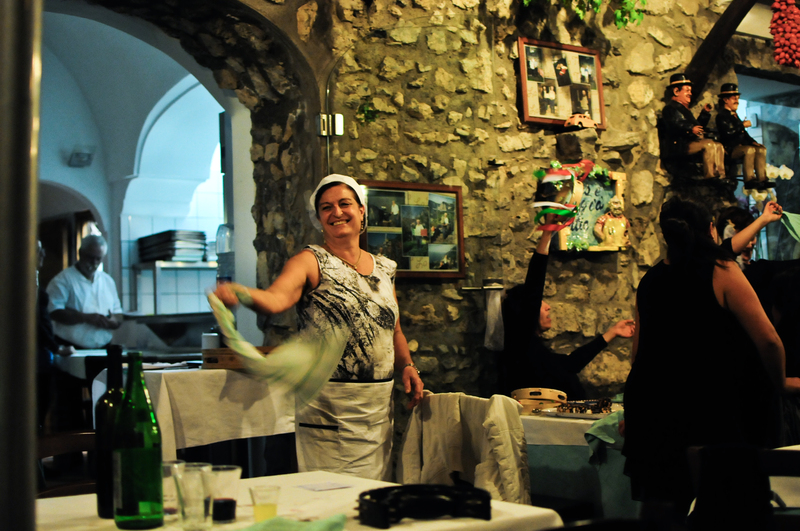 When I ask Raffaelo for an accommodation recommendation he turns to Peppe and after a few moments of boisterous Italian conversation between the family, I am shown to a room with a view that literally makes me weak in the knees. La Tagliata only has two rooms for rent and looks like it is my lucky day. I ask how I’ll get down to town and Peppe says “No worries, we take you,” as he makes hand motions and a zroom zroom sound that clearly means a motorcycle is involved. Sensing my fear, he says “or bus.” I choose the latter and after a few hours meandering through the hilly town below, I make my way back up. I consider walking the entire way, but the sun is setting and I’m not confident in my navigation skills nor in the older Italian man pointing me to the never-ending stone staircase leading up the mountain. I think he’s trying to tell me it’s a short-cut, but I’m a little worried the stairs may actually lead to his house. These Italian men can be quite flirtatious. After several minutes of winding up the mountain on the bus, the scenery starts to look unfamiliar. When the bus driver spots me in his mirror, his eyes show surprise. He slams on the brakes and makes a 10-point turn, right in the middle of the mountain, while laughing and ranting in Italian. I’m guessing he missed my stop somewhere along the way. He drops me safely, in front of La Tagliata. Peppe greets me with a small bottle of champagne and a glass and tells me, in his very limited English, to come next door, to the restaurant at 9:00pm for a very special night. “Why special,” I ask. “Music and dancing,” he says. I still haven’t erased the smile from my face after my lunch experience. I cannot imagine anything being better, but the evening does not disappoint. 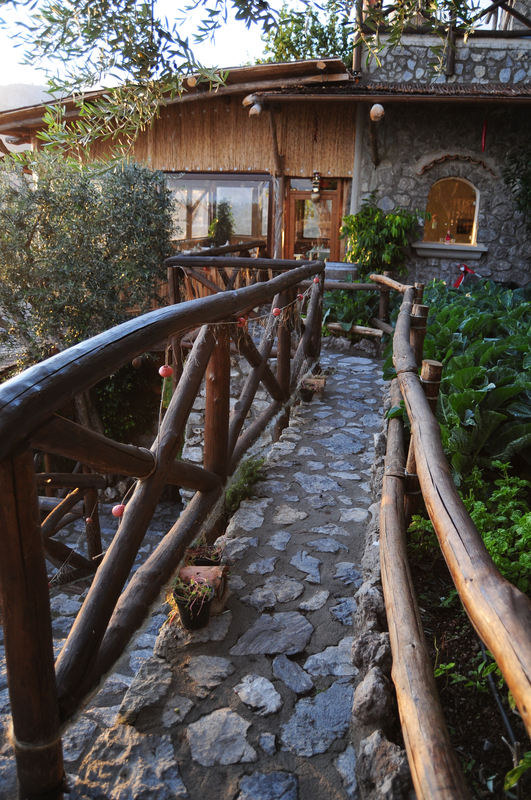 Traditional Italian music can be heard before I even step foot on the little stone bridge leading to the restaurant. The musicians alternate playing both levels. 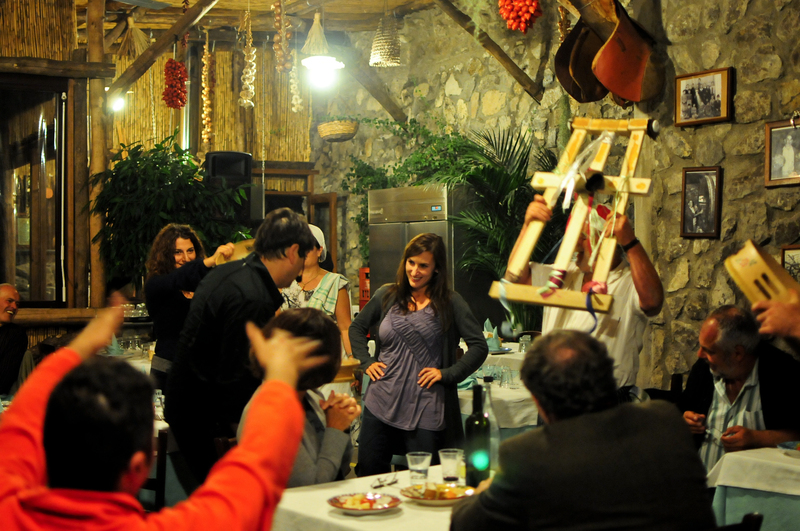 “Salute,” Clinking glasses and lively Italian conversation dominate the room, until the musician appears. Singing and clapping along to the music takes over. 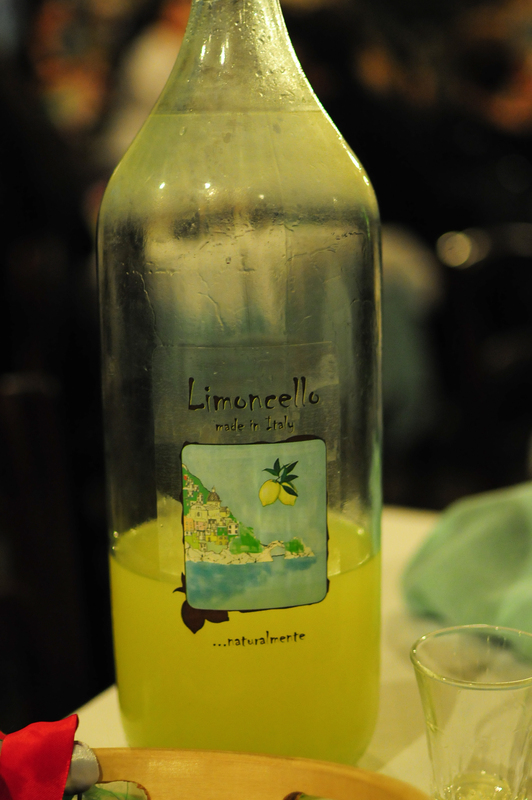 Dinner and dessert is once again outstanding and the wine and Limoncello flow throughout the evening. 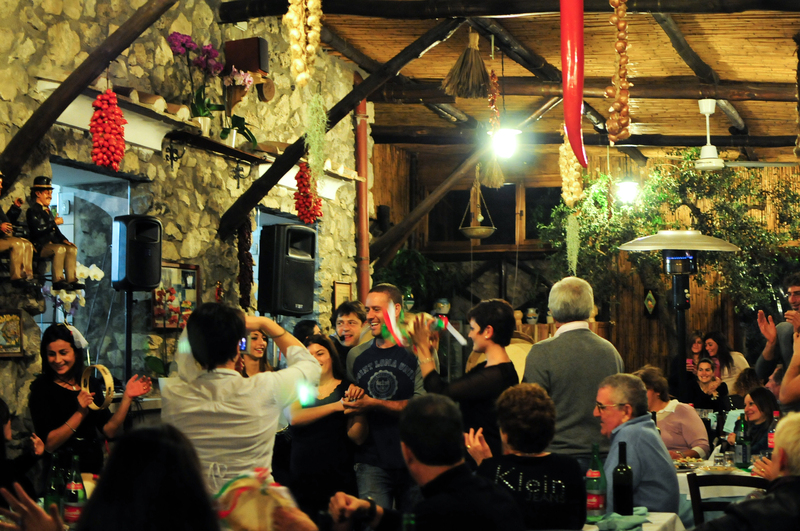 The singer urges all the women up to the front of the restaurant, one by one, where he has us perform a little solo dance. With the crowd cheering and laughing, it’s impossible to refuse. Afterwards, he hands us various instruments, including tambourines and other small noise-making devices, to play along with him. Mama and Papa appear from the kitchen to partake in the festivities. Napkins are swirled high in the air. The euphoria is infectious. The evening ends much to soon and my face hurts from laughing and smiling so much. I did not understand any of the spoken language here, but it does not matter a bit. It was all part of the magic.